Body of perpetrator at the Neve Shaanan Street bombing. Tel Aviv, July 17, 2002. Fun Day for ZAKA volunteers. Shlomo Bloch & colleagues collecting human debris from bomb scene. Shlomo Bloch studying at the Mor Yeshiva. Shlomo Bloch & Nathan Koenig collecting remains from bomb scene. Shlomo Bloch & Nathan Koenig at a Fun Day for ZAKA volunteers. Nathan Koenig at home with his son. 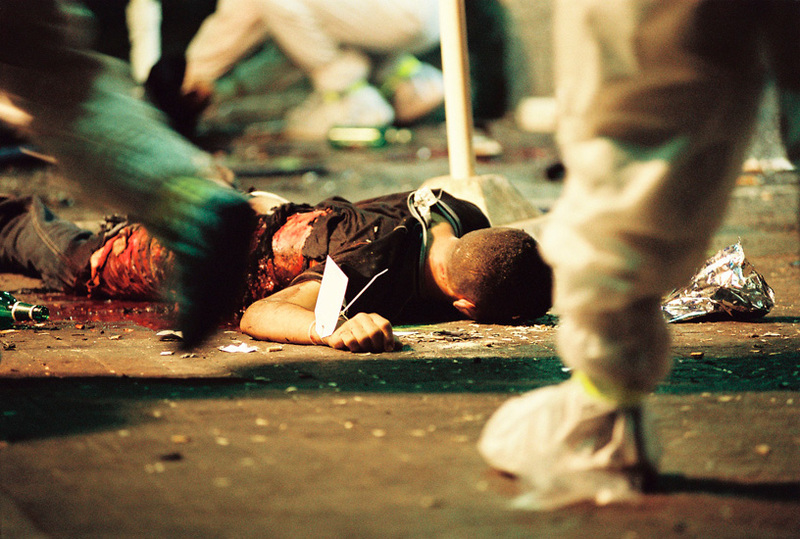 Nathan Koenig at the aftermath of the Hebrew University bombing. Shlomo Bloch & colleagues at a Fun Day for ZAKA volunteers. Yehuda Meshi-Zahav , founder of ZAKA at a debriefing session after the Hebrew University bombing. Yehuda Meshi-Zahav , founder of ZAKA at a Fun Day for ZAKA volunteers. ZAKA (Hebrew acronym for "Disaster Victim Identification") is a voluntary organization of Orthodox Jews that works alongside the emergency services in Israel. They are best known for collecting body parts and blood at the scene of suicide bombings, done out of a devout belief in Jewish burial law. During the peak of the wave of suicide bombings in 2002, when the volunteers of ZAKA were constantly working the grisly aftermaths, I wanted to know how they coped and managed to keep their nightmarish experiences out of their personal lives.